If ever there was a band that would benefit from releasing singles or even EPs instead of albums, it would be Cannibal Corpse. Let's face it, their albums post-Kill have been struggling to fit up to that album and its anthems like Death Walking Terror and Make Them Suffer, the likes of Priests of Sodom and Encased in Concrete standouts on albums that seem more interested in repeating a sound than advancing it. Here, that standout is Kill or Become, a song about being forced to kill zombies for fear of becoming one – a useful metaphor for death metal bands struggling to make a name for themselves, and not least a band like Cannibal Corpse, who are threatened by new names that play original death metal as well as the likes of Cannabis Corpse, who take them on at their own game. Still, Cannibal Corpse are the sort of band that will still be releasing albums that sound much like this twenty years after we're all dead, and on that basis A Skeletal Domain is absolutely fine. Songs like Vector of Cruelty are just distinct enough to be enjoyable, and the band have a knack for songwriting that means that even when not at full power their brand of death metal is blunt and brutal enough to keep your attention – Bloodstained Cement and Asphyxiate to Resuscitate are about as perfect as meat and potatoes death metal gets. Yet with all due respect to previous authors, Cannibal Corpse are never a band that would get 100/100 from me, and as enjoyable as this is, it's essentially indistinguishable from previous albums. Given another ten years or so, Cannibal Corpse will be in Motörhead territory, where their continued existence and production of samey yet solid albums would be cause for praise in and of itself. Life is strange; I like Cannibal Corpse, and those who liked previous albums, or indeed death metal itself, will enjoy this. 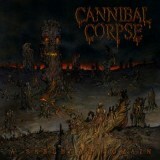 But that name counts for a lot, and if they weren't so good at it I'd accuse Cannibal Corpse of coasting.